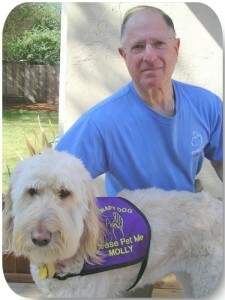 Larry Moskovitz has seen first hand the tremendous effects of Pet-Assisted Therapy. While he and his Therapy Dog Molly were visiting a nursing home, there was one man had never said anything to anyone since he had moved there. The first couple of times he would not saying anything when Larry and Molly visited him, but on the third visit when Larry asked if he would like to see the Therapy Dog today, he said “Woof-Woof” to Molly. Since then he has started talking more and enjoys petting Molly when she comes. Larry loves interacting with the residents and seeing their gratification, “It is wonderful to be received that way”, says Larry. Molly’s sweet and gentle temperament led Larry and Patti to do some research on Pet-Assisted Therapy online. In March of 2011, Larry and Molly joined the Share-A-Pet family and began sharing their love and improving the lives of so many. Currently, the therapy team visits Mills Estate Villa Assisted Living Residence in Burlingame, California and Sunrise Senior Assisted Living Facility in Belmont, California. They also visit hospitals: Kaiser Permanente Hospital, Redwood City, Ca. Kaiser Permanente Hospital, South San Francisco, Ca., Sequoia Hospital, Redwood City, Ca. 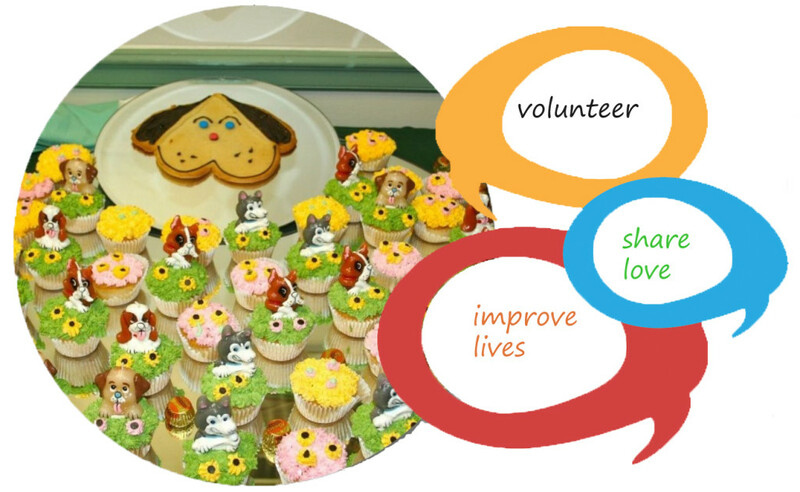 All of the residents look forward to the visits and they always look forward to Molly Day each week. A number of the people they visit are over 100 years old and Molly is always exceptionally gentle with them. They are so thankful to have the team be there. Larry looks forward to increasing his visits when he retires next year, as well as being able to spend more time with his children and seven grandkids. One resident who Larry and Molly visit is 103 years old and had never had any experience with dogs her whole life. She was reasonably timid when Larry and Molly first began visiting. One day, Molly laid her head on the woman’s lap and her eyes lit up with excitement. She now looks forward to seeing her new friend Molly every week. “We love seeing the joy we bring into these peoples hearts each time we visit”, says Larry. Larry and Molly are listed on the weekly schedule of all places and are told that the residents ask the Activities Director, “When is Molly coming? We want to pet Molly!” The visits are a very satisfying experience for both Molly and Larry and they look forward to being a part of Share-A-Pet for many years to come.